Radeln Sie durch Sevillas mittelalterliche Straßen auf dieser unterhaltsamen und faszinierenden 3-stündigen Fahrradtour. Sehen Sie mehr von den Wahrzeichen der Stadt als zu Fuß und genießen Sie die Flexibilität, oft für Fotos anzuhalten. 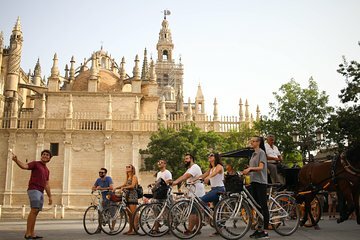 Radeln Sie entlang einer fahrrad-freundlichen Route, die Sie vorbei an Sehenswürdigkeiten wie Santa Cruz und Triana, Maria Luisa Park, Torre del Oro, die Kathedrale von Sevilla und den Königlichen Alcázar führt. Auf dem Weg erfahren Sie mehr über die reiche Geschichte und Lebensweise von Ihrem freundlichen Reiseleiter. Excellent tour very informative and friendly, great sights and information given by the guide. It did run over time not a problem to me but for some others I think it was. Great way to see and learn about the city. A leisurely and informative ride around the city. Decent pace. Lots to see. Easy ride with no steep inclines. loved it. Thank you for showing me your lovely city and Tirana! Antonio the kidnapper Caballos was one of the most entertaining guides I've ever had. Lots of interesting and funny anecdotes about the history, people and culture of Seville. You definitely get way more than your moneys worth with all the sites visited all over the city. He also took a ton of pictures of everything so that we didn't have to! It was great to have a guide who so clearly loves what he does and goes all out to make sure that we all had a fun and memorable experience. Just bring extra water if you're sensitive to the heat - Seville is blazing HOT in August! Great tour guide. She showed us a lot and helped plan the rest of the places to go while in Seville. It was over 100 degree weather, but was totally worth the ride! A great trip and an excellent way to gain an overview of the main highlights of Seville. Our guide, Adriana, was an expert in the history of Seville and added a sense of humour. The pace was very easy and we were not rushed from place to place a very enjoyable, worthwhile and inexpensive experience. Antonia was a wonderful guide! This was such a fun way to see Seville! He was knowledgeable of the history of the city and had a great sense of humor! An amazing tour Antonio is such a friendly and knowledgable guide, he shared so many local insights and many excellent recommendations. Would highly recommend 5 star experience. This was an amazing bike tour with amazing tour guides. The tour guides were knowledgeable and hilarious. The best part was at the end of the tour they gave us maps, mapped out restaurants, sites that we desired to return, and things to do customized for each customer. I would highly recommend this tour. This was the best tour that we had on our entire 3 week vacation. Our guide Antonio took us on a 6 hour tour of the city. He frequently stopped to point out various historical sites and features. He was very, very thorough, knowledgeable and attentive. He also frequently took photos of the group that he emailed to all of us. Antonio must have sent us 50 photos.. Halfway through the tour we stopped in a market that was buried in the heart of the old city which was simply wonderful. Great food and wine that was inexpensive. We also really lucked out on the weather and were in shorts and t shirts the entire tour. Wonderful tour, I thoroughly enjoyed the Seville sights, in particular Plaza de Espagne, with our very entertaining guide.